2011 was, I am told, the second warmest year on record, but it was not the summer that particularly contributed to that statistic. For do you remember April, spring days heavy with the merciless sun, the temperature well into the eighties before the middle of the month, day after day? And then, a damp, humid May boiled the countryside into an outrageous green, the hedgerows swelling into the narrow lanes, the ground elder and angelica luminous in their sprawling, not a patch of bare ground to be seen anywhere. An old man in a village pub near Holt told me it was like 1940, the first spring of the Second World War. Summer was mild in comparison, but then the hot days came back until, in early October of all months, the temperature soared up to the eighties again. How could I resist taking my new bike up into the north Norfolk lanes? I was in my element, with the promise of more rides to come. But in fact the weather would break within a week, and by the time the clocks went back the trees were bare and dripping with damp, the fields silvery with the rime of the first frosts. 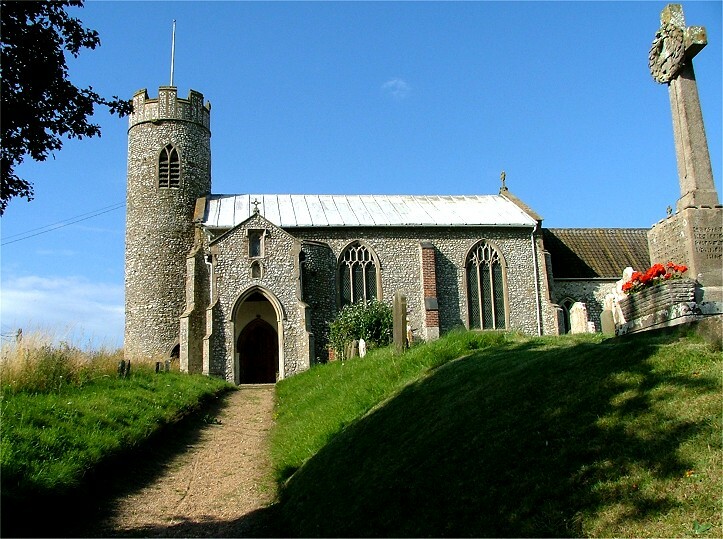 I was cycling from Cromer to Norwich, and one of my first goals was St John the Baptist, Aylmerton. There were just two churches left in north Norfolk that I had yet to see inside, and this was one of them. I first came here in the summer of 2005, and I was a bit disappointed to find it the only locked church of eighteen that I visited that day. There wasn't even a keyholder notice. I complained about this, as you'd expect. 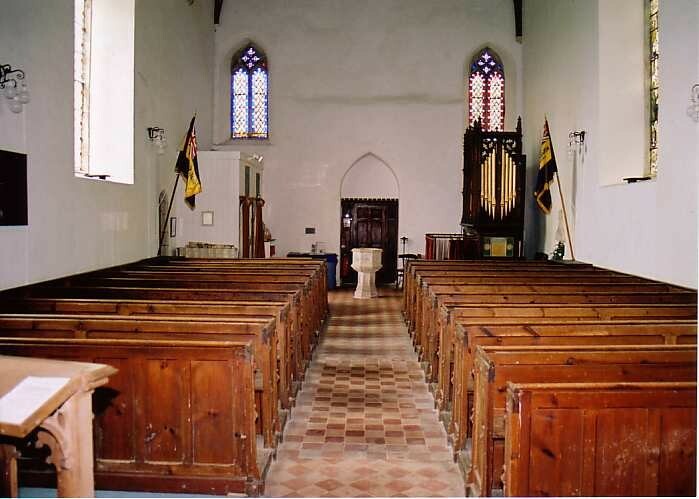 I received a charming e-mail message from Professor Michael Balls, who was then the churchwarden of Aylmerton (and, for your interest in passing, also the father of the then-newly elected Labour MP Edward Balls), apologising that I had found the church locked, and explaining that they had just suffered a serious and expensive act of vandalism involving the water supply to the church. Since then, the church has been opened every day, and I was pleased to know that this parish is one of several now in the care of Allan Barton, a long-time contact of mine. You climb the steep path from the road to this neat, trim little round-towered church in its pretty village stretched along the road just to the south of Sheringham. The top part of the tower was rebuilt in the first decade of the 20th century, when the east window glass was also put in place. 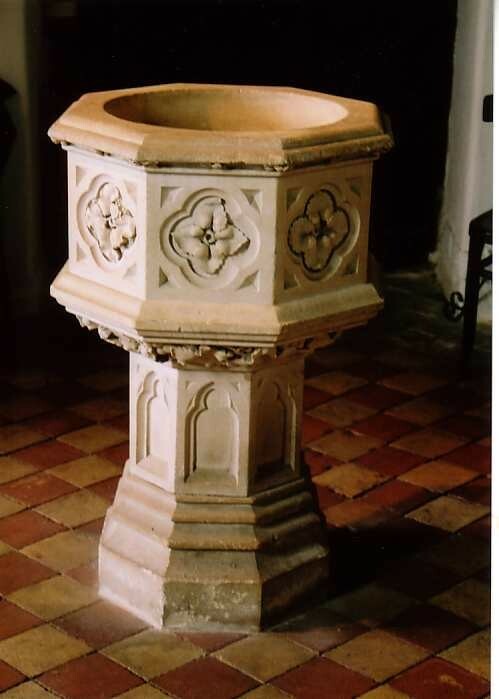 There were some busy restorations in the 1860s and 1870s, and the font is an unfortunate replacement of this time, and the interior has much of the feel of the Anglo-catholic sentiments of the late 19th and early 20th Century. But much that is medieval survives, including a delicate sedilia and piscina. 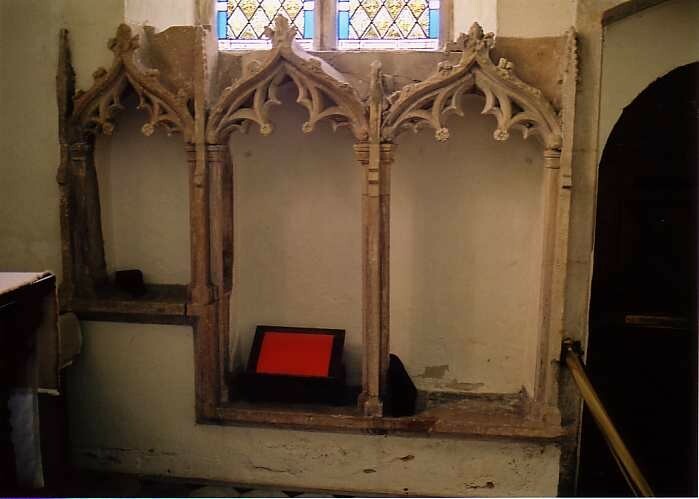 There are the bones of a rood screen, and the pulpit is an elegant wineglass. Both altars are rather curious, that in the chancel made up of strapwork and the one in the south aisle with a roundel of a Flemish madonna and child set in an art deco reredos, for all the world like an ecclesiological wireless set. Also art deco is the war memorial, set oddly in the side of the organ. On my first visit I had only been able to explore the graveyard.There are a couple of interesting 18th century headstones, including one with a skull, a coffin and a snake biting its tail, the symbol of eternity. A 19th century gravestone is for an honest inoffensive friend - Honest is good, but I'm not sure that I'd want to go through eternity with the tag inoffensive - you can imagine all the other souls in purgatory nudging each other, pointing and saying "look, you see him? He's inoffensive..." Not far off, a modern headstone has an elegant scallop shell of St James set into it. Leaving the village, I headed south towards Aylmerton Cross, a restored medieval preaching cross standing at the junction with the road from Metton to Gresham. A rough track going off here shows that it was once a crossroads, and the old track points, intriguingly, across the fields to the holy shrine of Walsingham.